â��S. S. Controlsâ�� is specialized in the manufacturing and exporting of high end Battery Tabs Welding Machine in the national as well as international markets. 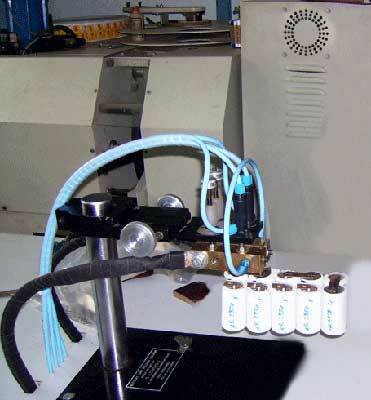 The Microspot Welding Machine for Capacitors made available by us is manufactured using highly advanced technology. Our Battery Spot Welding Machine is used in a number of applications like manufacturing of battery packs, lead welding of capacitor elements and welding of small parts like bulbs, thermocouple wires, wire harnesses etc. In addition to this, the company is counted as one of the reputed Battery Tabs Welding Machine Exporters in India. Controller : Microprocessor Based Welding Controller, Our Model- 3W-OL / 15 For Precise Welding.Fully Synchronous, with Half Cycle Control. Welding Head : Pneumatically Operated Welding Head along with series Welding Assembly and adjustable platform to hold different sizes of battery cells. 100% Liner motion. No Electrode skid movement during welding. Thickness 0.03mm-0.6mm. Lead Welding of Capacitor Elements. Welding of Small parts like Bulbs, Thermocouple Wires, Wire Harnesses etc.